Love it or hate it, technology continues to advance with no signs of slowing down. Even in an industry as primal as hunting, technology continues to seep in. Since as recent as the Y2K it could be argued that trail cameras have been the single largest technological advancement in the entire realm of hunting. Think about it, it wasn’t too long ago when we dropped off a roll of Fuji Film at Walgreens and patiently waited (and paid extra) for the film to be developed at the one hour photo center. Now, we’re getting photos sent in real time from our wireless trail camera that’s stationed four hours away overlooking your favorite food plot! The important takeaway here is that hunter’s use of trail cameras opened up a huge commercial opportunity for camera manufacturers to innovate beyond what was thought possible. When it comes to choosing a trail camera for scouting or surveillance, most of us are faced with the dilemma of quantity vs. quality. Do I spend more money on fewer, but higher quality trail cameras? Or do I buy more, lesser quality trail cameras? Hopefully you can have the best of both worlds and place 10 Bushnell Wireless Cams out, but for most of us, we have to settle and look to get the most bang for our buck. Lucky for us, the trail camera market is ripe with competition, which has ultimately created higher quality at a better price. Trail cameras with features that used to cost well over $400 are now available for under $200. That’s great, so how do you decide what’s best? This buying guide for trail cameras should help! Deer hunters rely on ultra-fast trigger speeds and large detection zones to capture deer or other game as they move past the camera. Trail camera placement plays a big role in how the camera will ultimately perform. 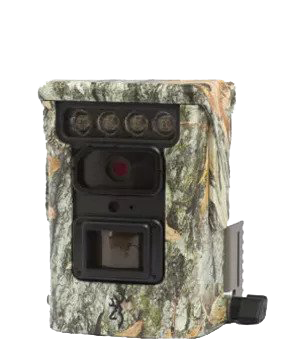 For instance, you’ll want a faster firing trail camera like the Browning Strike Force HD when placing it over a trail or field edge where animals are typically on the move. Likewise, you can get by with a slower trigger speed if you plan to use them over bait where animals can be expected to hang around for a bit. Battery life is another important consideration for hunters since we often rely on trail cameras to be our eyes in the woods while we are away. Browning, Bushnell, and Minox all have great battery life by today’s standards, but the Browning’s do have a slight edge in this category. Nonetheless, it’s recommended you use lithium ion batteries for best performance. If you’re unable to check trail cameras for long period of time, powering them up with a solar panel or extra external battery will ensure the camera stays functioning far longer than standard batteries would allow. Wireless and Browning Defender come with an obvious uptick in price and may require a monthly cellular data plan, but who’s to put a price on real-time information delivered straight to your smartphone during the rut? For a hunter, you can’t deny the power of receiving this type of intel as it happens without having to step foot in the woods. Quite plainly, wireless trail cameras are game changers. Next thing you’ll want to consider is if you plan on running the camera on video mode or just picture mode? Videos are great, especially when you hang a camera over an active scrape. Nothing gets your blood pumping like watching that monster buck you’ve been after rake his antlers and paw the dirt. Video mode will chew through battery life much quicker, but a lot of times it’s worth it. Also, be sure you have the right type of SD card if you plan to run the trail camera on video mode, as some can’t process HD video. For pictures, many hunters prefer a camera with burst mode functionality. Burst mode allows you to set the camera to take anywhere from 1-10 pictures every time the camera sensor is triggered, which really helps when trying to identify individual bucks. Lastly, if you’re a public land hunter or simply don’t want your trail cameras taken by trespassers, spend a little extra to get the steel security boxes for your trail cameras. Both Bushnell and Browning have steel lock boxes designed specifically to fit their trail cameras. Security boxes are also a smart idea if you hunt in bear country! 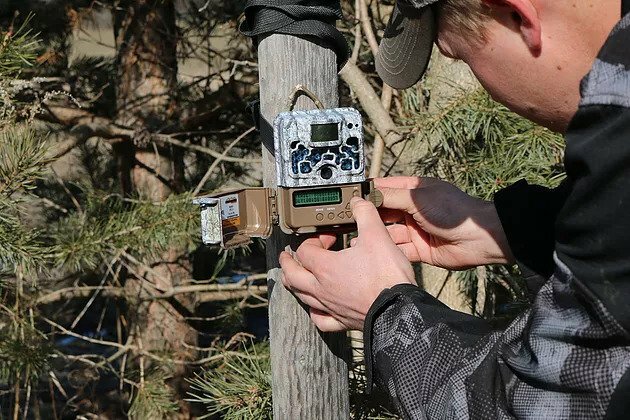 Regardless of how high tech your trail cameras are, the initial breakthrough of this device has become a total game changer for hunters when trying to pattern and target mature whitetails. Trail cameras provide all sorts of great information that can help you bag a bird. Typically you’ll want to set them up in strutting locations to determine when and where you need to be sitting with a shotgun in hand. Strutting zones include open fields, food plots, pastures, ridge tops, and logging roads, to name a few. Since you’ll often be scouting open areas, you’ll want a trail camera that has the time-lapse feature. This is one of the most underutilized features on trail cameras, and arguably one of the most useful – for deer and turkey. Set your trail cameras up facing either north or south to prevent sun interference and set them to take a picture every 5-10 minutes during daylight. Since it’s not deer season you’re not worried about identifying an individual buck, more so just trying to figure if and when turkeys are using a particular area. If they are, hopefully you can coax them in with your calling and decoys. Pair this feature with a wireless cellular cam and you’ve got yourself a game changer. As we mentioned in the deer hunting portion, there’s nothing more valuable to a hunter than real time information on an elusive a target animal’s whereabouts. Since trail cameras found their niche in the hunting industry, they often find themselves hanging in the middle of the woods or along a field edge surveilling for deer and other wildlife. It’s important to remember, the same features that make trail cameras valuable to the hunter also make them perfect for the everyday homeowner or cabin owner. For the price and versatility, trail cameras offer tremendous value to homeowners and absentee property owners as surveillance devices. Nowadays, between cellular and Wi-Fi enabled trail cameras like the Bushnell Trophy Cam HD Wireless or Browning Defender 850 it’s easy to keep a real-time watchful eye on your property when you’re not around. When it comes to selecting a game camera for outdoor surveillance, image quality and trigger speed are two features that should be at the top of your list. Trigger speed is simply the amount of time it takes for the sensor to detect movement and the shutter going off. Nothing is more irritating than going through the work to buy and setup a trail camera only to get blurry or missed pictures of unwanted trespassers. 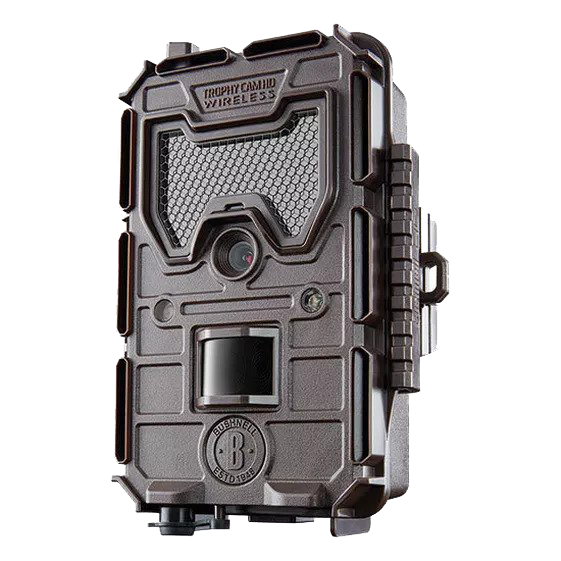 This is where a trail camera that has lightning fast trigger speeds and detection circuits like the Bushnell Trophy Cam HD Aggressor excels (0.2s trigger speed, 0.5s recovery time). Of course, a fast trail camera is only as good as the pictures or video it captures and in order to identify a license plate or a face, you’ll want to employ the help of a trail camera that boasts great picture and video quality like the aforementioned Bushnell or the Browning Strike Force HD PRO. Both options record in HD as well, which is a popular choice for those keeping an eye on property. Be sure to lock your surveillance trail cameras in metal security boxes and opt for a camera that doesn’t emit light when triggered like the No Glow Bushnell Trophy Cam. The No-Glow models feature black LEDs that are invisible to both game and humans. In the end, today’s trail cameras are loaded with features – from wireless game cameras that text you HD video and solar powered trail cameras. Whether you’re simply looking for a quality trail camera at a good price point or perhaps something a little more advanced, hopefully this buying guide helped you decide which trail camera is right for the job, whether it’s chasing big bucks or property surveillance. Pairing a Riflescope with a Rangefinder for Big Game Hunting 6 Most Common Mistakes Hunters Make While Using a Laser Rangefinder.